Vanilla was initially rescued from a pound in Downey where she had been abandoned by her owners. Thanks to generous donations her life was saved and we brought her to our rescue. Vanilla is fearless, full of personality and would very much love to have a family to share yummy bananas with (her favorite treat!). 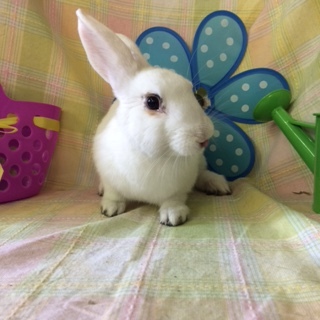 This sweet bun has been with us for almost a year now, give her a chance and she will play all day and bring joy to your life.